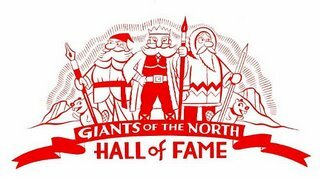 Introducing our new logo for the Giants of the North! The great design above, for the Canadian Cartoonist Hall of Fame, is by renowned cartoonist Seth. Thanks to Seth for taking time out of his busy schedule to work on this project! A new inductee to the Giants will be announced at the 2006 Doug Wright Awards.